Moderated by Valerie Lincy, executive director of the Wisconsin Project on Nuclear Arms Control, and John Lauder, former Director of the Intelligence Community’s Nonproliferation Center and now an independent consultant on nonproliferation and arms control. The United States withdrew from the nuclear agreement with Iran – the Joint Comprehensive Plan of Action (JCPOA) – in part because it did not address the threat posed by Iran’s missile program. Following this withdrawal, the United States has expanded trade and financial sanctions aimed at punishing Iran economically to counter a range of threats, including ballistic missiles. The United States is also working with other countries to constrain Iran’s missile program, which is still subject to U.N. sanctions. In public remarks last September, Brian Hook, the head of the State Department’s Iran Action Group, said that the United States is “coordinating with allies to interdict missile-related transfers” to and from Iran and to target “choke point technologies and procurement strategies” used by Iran. According to Mr. Hook, U.S. policymakers are also assessing the conditions for renewed negotiations with Iran and would seek a formal treaty that addresses “the totality of threats that Iran presents.” He described a treaty as the only “enduring and sustainable” way to address those threats. The recent decision by the United States to withdraw from the Intermediate-Range Nuclear Forces (INF) Treaty with Russia in response to Russian violations likewise has focused attention on the forms of missile limitations the U.S. administration sees as desirable and achievable. The issues associated with INF compliance have also demonstrated both the value of monitoring measures and the difficulty of publicizing violations without revealing sources and methods. Monitoring and verification are critical both to the implementation of sanctions and to any formal agreement with Iran that restricts its missile program. The process for monitoring and verification is influenced by the increasing public availability of open source tools and data, such as machine learning, remote sensing technologies, and trade and corporate data. These tools and data, collectively referred to as “public technical means,” allow a greater number of actors, including from the non-governmental community, to contribute to monitoring and verification efforts. In June 2018, the Wisconsin Project on Nuclear Arms Control brought together an expert panel for a private discussion about how open source tools and data can support U.S. and multilateral efforts to constrain Iran’s missile program, both through sanctions and through an eventual agreement. Specifically, the panel assessed the status of Iran’s missile program and considered whether technical “choke points” in the program could be identified and exploited through public technical means in order to complement government efforts to raise the cost and slow the development of this program. The panel also discussed how open source tools and data might support sanctions by identifying instances of illicit procurement and/or sanctions evasion. Finally, the panel considered how these tools might contribute to the monitoring and verification component of a new agreement with Iran, in the context of active negotiations with North Korea and informed by other missile limitation efforts like the INF Treaty. The panel discussion was held in Washington, D.C. and moderated by Valerie Lincy, Executive Director of the Wisconsin Project, and John Lauder, former Director of the Intelligence Community’s Nonproliferation Center and now an independent consultant on nonproliferation and arms control. The other participants were Chris Bidwell, Senior Fellow for Nonproliferation Law and Policy at the Federation of American Scientists, Catherine Dill, Senior Research Associate, James Martin Center for Nonproliferation Studies, Middlebury Institute of International Studies at Monterey, Charles Duelfer, former Special Advisor to the DCI for Iraqi weapons of mass destruction and now Chairman of Omnis Inc., Mike Elleman, Senior Fellow for Missile Defense at the International Institute for Strategic Studies, Phil Rosenberg, Senior Advisor for Financial Intelligence at the Chertoff Group, Richard Speier, Adjunct Staff at RAND Corporation, Vann Van Diepen, former Principal Deputy Assistant Secretary of State for International Security and Nonproliferation, and Varun Vira, Chief Operating Officer at C4ADS. The event was co-sponsored by the Nuclear Verification Capabilities Independent Task Force with financial support from the John D. and Catherine T. MacArthur Foundation and another private foundation. The panel found that the expanding availability and decreasing cost of open source tools and commercially available data can support both the implementation of sanctions targeting Iran’s missile program and the monitoring of a potential agreement restricting that program. Such tools and data could help identify and target choke points in Iran’s program, thus raising the cost to Iran of improving its missile capability. In particular, space-based remote sensing technologies can help monitor known locations in Iran involved in missile development and identify possible additional facilities, while publicly available corporate and trade data can support network analysis related to missile procurement. Machine learning can be applied to these disparate data sources to support monitoring and enhance analysis. Despite these contributions, several panelists cautioned that emerging open source capabilities applied by non-governmental actors do not diminish the primacy of governments. Only governments can satisfactorily validate the results of open source analysis using classified sources and methods and only governments can make verification judgments. Likewise these panelists warned that non-governmental actors may introduce information publicly that complicates government efforts, including disclosing sources and methods and helping Iran improve its concealment and deception techniques. The risk of moral hazard may increase – proliferators benefiting more than the public from a disclosure – as non-governmental actors access increasingly sophisticated imagery and deep data techniques. The panel further concluded that any lasting agreement with Iran might need to reflect that ballistic missiles are an integral part of Iran’s conventional warfighting capability rather than exclusively a future delivery vehicle for nuclear weapons. The parameters of a future agreement could be informed by precedents like the INF Treaty and any agreement’s monitoring requirements should be tailored to address appropriately what is being restricted. Finally, the parameters and monitoring arrangements of any agreement struck with North Korea that restricts its missiles should be seen as applicable to Iran. Negotiators should be attentive to setting precedents in each of the possible missile discussions that would be helpful in other missile control efforts. Following are the roundtable’s findings, which are a composite of the panelists’ individual views. No finding should be attributed to any single panelist or be seen as a statement of the policy of any organization with which the panelist is affiliated. 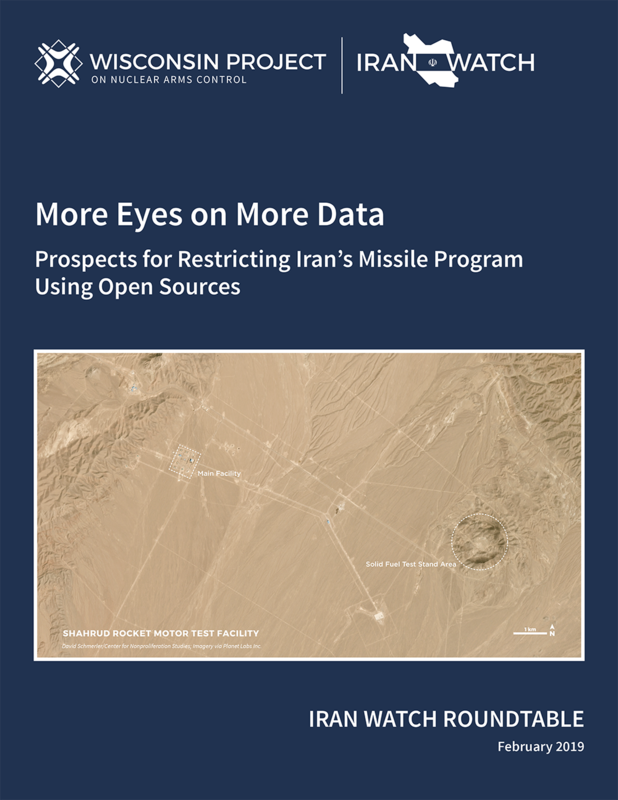 Open source tools and data could enhance the pressure campaign on Iran by identifying and targeting choke points in Iran’s missile program, slowing the program’s development, and raising the cost to Iran of improving its missile capability. Iran has pursued a two-track approach to missile acquisition since the Iran-Iraq war, prioritizing the procurement and production of liquid-fueled missiles and the production of solid-fueled missiles. While Iran largely has achieved self-sufficiency in the production of SCUD-type liquid-fueled ballistic missiles, it remains reliant on foreign technology and materials to improve the accuracy and range of these missiles and to build solid fueled missiles and related production infrastructure. The panel therefore agreed that it would be possible to target these specific chokepoints and that open source tools and data could help do so. Specifically, the panel noted Iran’s need for guidance technology, including laser and fiber optic gyros, microelectro mechanical systems (MEMS), as well as lightweight and heat resistant materials that would help Iran with re-entry for longer-range missiles. According to one panelist, Iran does not appear to have acquired or developed isogrid and orthogrid technologies, with which it could fabricate lighter weight liquid-propellant casings with a similar structural capacity. Such technology would allow Iran to extend the range of its missiles without reducing payload. Iran’s need for small turbo fan engines for cruise missiles was also identified as a key choke point, as was aluminum powder and other materials for the production of solid propellant. In addition, the panel noted that production equipment for these items would be valuable for Iran, which has long emphasized indigenous production. The acquisition of production equipment was identified as particularly challenging to target because much of it is dual-use, even if its export is controlled by multilateral regimes. Relatedly, the panel emphasized the importance of trained personnel in accomplishing Iran’s indigenous production goals. The acquisition and use of production equipment is directly tied to individual expertise in operating such equipment. Thus, sanctions aimed at inhibiting missile technology acquisition should target both persons and trade flows. The panel suggested first compiling a list of the key materials and production equipment needed by Iran. Such a list could be compiled using open sources, such as information published by the now-dissolved U.N. Panel of Experts on Iran. Second, experts could identify and map the global manufacturing base for these items. Once the countries and perhaps specific firms are identified, publicly available statistical trade data could be used to visualize the trade flows and import markets for these items. This process could help reveal the transshipment routes that Iran has or could use for technology acquisition. Similarly, reviewing technical publications and scientific journal articles by Iranian engineers could help identify key individuals contributing to missile development, what they are working on, and the institutional affiliations of these individuals. The panel agreed that disrupting Iran’s supply chain for critical materials would be useful and that sanctions may already have had an effect on the pace of Iran’s solid-fuel missile program. For example, the successful development of solid-propellant motors is critically dependent on a consistent supply chain for basic ingredients, ensuring that motor tests are conducted using the same materials, from the same producer, using the same production line. Without such a consistent supply, it is difficult to validate the materials and ensure quality control. If motors fail to perform as expected during tests, it becomes difficult to assess the cause by isolating each variable. The U.N. Panel of Experts documented numerous instances of such materials being interdicted en route to Iran, likely complicating Iran’s ability to consistently acquire critical materials from the same suppliers. While sanctions and interdictions may help slow the program and raise the costs to Iran of pursuing ballistic missiles, the panel agreed that Iran is inherently capable of producing longer-range missiles. This assessment is based on Iran’s space launch program, pursuit of solid-propellant systems, and illicit acquisition of long-range land-attack cruise missiles. Some panelists suggested that Iran’s long-range missile program may be in “hedge” mode, much as Iran essentially placed its nuclear weapon program in “hedge” mode as a result of the JCPOA. One panelist noted several indicators of Iran’s longer range goals: ongoing tests of space launch vehicles; the January 2017 test of the Khorramshahr liquid-fueled missile, which likely is derived from North Korea’s BM-25 and may have a range beyond the 2,000 km declared by Iran; and revelations that Iran is operating a missile test site near the city of Shahrud where it appears to have tested large rocket motors. Space-based remote sensing technologies, including optical satellite imagery, can help monitor known locations in Iran involved in missile development. A variety of space-based remote sensing technologies with relevance to nonproliferation are deployed and their products are commercially available. There is an abundance of satellite imagery from multiple commercial providers in multiple countries. Small satellites with lower resolution images (1-3 meters) can image a location frequently. In some cases, a single location can be imaged multiple times in one day. Traditional large satellites with a much less frequent revisit rate offer higher resolution (25-70 centimeters) images. The panel noted that high and low resolution optical satellite imagery can be used effectively in combination to track Iran’s missile development. Frequent images of suspect sites allow analysts to compare images over time and identify changes; high resolution imagery can provide much greater detail about such sites and perhaps help map production facilities and estimate the size of production equipment. Synthetic aperture radar (SAR) imagery provides further enhancements, including the ability to penetrate clouds and to image at night. However, the panel cautioned that SAR remains costly and is difficult to interpret without specialized training. The missile test site near Shahrud, referenced above, illustrates the way in which satellite imagery can support the identification of locations where Iran is pursuing longer-range missiles. The site was used in 2013 for a single missile test but otherwise appeared dormant. Researchers from the James Martin Center for Nonproliferation Studies (CNS) analyzed the structures and ground markings at the site using optical satellite imagery and concluded that the site likely is dedicated to developing solid-fuel, long-range missile technology. The imagery allowed researchers to date recent engine tests – in 2016 and June 2017 – based on when ground scars appeared. The size of the missile test stands also provided valuable information: researchers concluded that the engine tested in 2017 could have powered between 62 and 93 tons of thrust, possibly enough for an intercontinental-range missile. Finally, the images did not show any fuel storage tanks or fueling stations, suggesting that the site is for solid-propellant engines. According to one panelist, the site may instead be connected to Iran’s space launch program, but this panelist noted that the types of motors needed for space launch could be transformed into missiles and flight tested quite quickly. The researchers at CNS also used SAR images to confirm that the site remained active. These images revealed foot and vehicle traffic at the site, particularly at locations where engine tests were conducted. Several panelists emphasized that SAR images could be particularly useful in Iran. They allow for imaging at night – when Iran’s outdoor engine tests are likely conducted – and work well in sparsely vegetated areas. The recent open source analysis about the Shahrud site demonstrates how commercially available remote sensing technologies can provide evidence that a program is more advanced than commonly estimated. Iran had not tested its two-stage, solid-fueled Sejil missile since 2012, which previously created uncertainty as to its status and the status of Iran’s long-range solid-propellant program overall. The panel cautioned that optical and SAR imagery may not be helpful in predicting missile flight tests, given the short timeframe between the preparation for a test and launch. However, such imagery can provide information about the type of system Iran has flight tested, the range achieved, and the capability of the system that was tested. Such analysis is already being done to monitor Iran’s compliance with the missile limits in U.N. Security Council resolution 2231. However, there is no unified verification judgment from the United Nations; permanent members of the Security Council disagree about whether such tests actually violate the resolution. Publicly available corporate and trade data can support network analysis related to missile procurement and uncover additional nodes in a procurement network; such data can also be used to identify instances of sanctions violation. Open data, including trade data, corporate registry information, academic and scientific publishing, maritime and airplane traffic, and information from trade shows can help identify instances of sanctions evasion and illicit procurement. These data also can help identify the entities involved in such illicit activity. The panel agreed that these data are particularly valuable for monitoring when they are brought together and compared. Shipping data, including manifests and bills of lading, contain some information about the items in a transaction, including an HS code from the harmonized tariff system developed by the World Customs Organization. The panel was moderately confident in the correlation between HS codes and items controlled by the Missile Technology Control Regime (MTCR). As a result, if goods are accurately declared, it should be possible to use trade data to trace commercial activity to Iran, or to a country of concern for transshipment to Iran, for items of interest captured within a broader HS code. Such micro-level transactional data is directly available from some customs authorities and commercially available from third-party providers for some countries. It generally includes information about the buyer, seller, and shipper in a particular transaction. It may be possible to use such data to identify parties involved in shipping missile-relevant technology to Iran. In addition, macro-level statistical trade data is available through the U.N. COMTRADE database, which provides valuable information on the flow of goods of interest. Corporate data can provide additional information about the parties around the world supporting Iranian missile procurement. Many countries have open corporate registries that provide information about registered companies, including company contact information, directors, shareholders, and associated businesses. This information may be freely available; it may be available for purchase; or it may not be publicly available. Similarly, real estate records may provide information about a company’s ownership structure, as well as party identification information such as tax ID numbers. Individuals or companies that are known to be part of an Iranian missile procurement network may have additional relationships that would be revealed by mining corporate data. Information about suspicious financial transactions is held by banks and shared with governments; it is not publicly available, thus limiting the ability to use open source information to track the financing of missile proliferation. However, the panel noted that information on correspondent banking relationships, which banks have a business interest in making public, can be helpful. This information is publicly available in resources such as the Bankers Almanac, although they are often costly to acquire. According to one panelist, Iran continues to rely on the same well-known financial actors to support its missile program, including Bank Sepah, Bank Melli, and Bank Mellat, and their overseas subsidiaries. The role of these banks has been described publicly in past U.S. sanctions notices. These banks access foreign currency through correspondent relationships with foreign financial institutions. Mapping these banking relationships would provide insight into how Iran finances overseas procurement for its missile program. Combining these disparate, unclassified data sources would allow analysts to see high-level convergence, such as the use by Iran of certain jurisdictions for sanctions evasion or illicit procurement. It would also reveal specific convergences, such as reliance on certain lawyers or corporate formation agencies within these jurisdictions. Combining corporate registry and real estate records from multiple countries might reveal common parties and new connections. Similarly, comparing corporate and trade data with a known list of entities supporting Iran’s missile program, such as parties on national or international blacklists, could expose the alternative names or locations of sanctioned entities, or help identify additional nodes in an illicit procurement network. Using network analysis software to link parties of concern and the flow of sensitive goods would further enhance this exercise. One panelist noted that the U.S. decision to withdraw from the JCPOA and re-impose previously waived sanctions on Iran broadens the sanctions targeting field to include sectors supporting Iranian missile proliferation economically, such as the banking, shipping, and energy sectors. The evidentiary threshold for these new sanctions targets more easily can be met using open data, such as maritime AIS, an automatic vessel tracking system used on ships, and information about vessel owners and operators. This information might also be usefully combined to identify instances of sanctions evasion: satellite imagery combined with vessel AIS or airplane ADS transmissions can help predict the destination of a ship or airplane even after their trackers are turned off; or satellite imagery combined with vessel movement information could help identify instances of illicit ship-to-ship transfers of Iranian oil. Machine learning applied to satellite imagery and trade and corporate data can enhance monitoring of missile development sites in Iran, identify new missile sites, and detect instances of sanctions evasion or illicit procurement; however, such techniques are not infallible and primarily should serve as leads for further analysis or collection. The volume and diversity of data described above, not all of it in English, poses a challenge for traditional analysis methods that machine learning techniques can help mitigate. The panel agreed that several techniques present particular utility for proliferation-related research, including machine learning applied to satellite imagery, training neural networks to analyze satellite imagery or trade data, and data engineering such as natural language processing to parse bulk data. Large swaths of satellite imagery can be analyzed for change detection and object identification at known Iranian missile sites using machine learning techniques. This can be done using established algorithms or deep neural networks. Neural networks are computing systems that allow multiple algorithms to work together to process complex data inputs. As described above, this would allow analysts to more easily see if there is increased activity at missile sites, which may be an indicator of expanded research and development activity or preparations for a flight test. Applying machine learning to open source imagery to identify new sites is more complicated. One panelist noted that relative to North Korea, Iran publishes fewer images of its key missile facilities and systems. This makes it difficult to constitute a robust “training” data set used to teach open source machines what to search for. It may be possible, including with the use of synthetic data, to train a neural network to identify what a ballistic missile test facility in Iran looks like, and to then ingest, on a daily basis, all new imagery for the entire country to see if there are other, similar sites. It may be more difficult, though not impossible, to do so for open source analysis of missile production facilities or sites used for missile research and development. The success of this effort would depend in part on whether Iran is consistent in the way it builds and organizes its missile-related sites so that a machine can be taught what to look for based on a limited number of examples. The panel cautioned that Iran may not proceed in the most logical manner in its missile development because of work-arounds necessitated by technical shortcomings or material it is unable to acquire or produce or as a means of concealment and deception. Neural networks might also be trained to understand and analyze trade data. For instance, cluster analysis of the manufacturing base and trade flow of sensitive items could identify certain areas that are receiving these items or the supply chains that may be delivering the items to Iran. The panel agreed that the key to analysis in this data-rich environment is fusing disparate sources of data to support the monitoring process and verification judgments. Machine learning is critical to this process. However, the panel cautioned that the results produced by machine learning techniques should be used carefully. These results often are greeted with suspicion, in part because machine learning algorithms generate leads or make choices that are not fully understood, including by data scientists themselves. These algorithms are essentially black boxes, which may raise suspicion that their results have been manipulated. It may be difficult to present the results to a country or company and request a legal action, such as an interdiction or an asset freeze, which might be challenged in court where a higher evidentiary threshold would be required. In addition, algorithms are often proprietary and developers are unwilling to share intellectual property that they are trying to market commercially. The panel concluded that these tools provide leads for additional evidence gathering but emphasized that the results are not finished products. The increasing use of open source data and machine learning by non-governmental actors in public analysis may complicate national monitoring and verification efforts and should be used with care. Non-governmental organizations (NGOs) are playing an increasingly prominent role in the proliferation- and sanctions-related monitoring process in Iran, and rely on publicly available data and machine learning techniques to do so. There was some disagreement among the panelists about the risks associated with this contribution. Some panelists cautioned that NGOs could impede government activity, whether by inadvertently disclosing government sources and methods, or disclosing monitoring indicators that would help Iran improve its camouflage, concealment, and deception techniques. For instance, if an algorithm used to identify a new missile site in Iran is described publicly, it becomes easier for Iran to spoof the algorithm by making small changes or adjustments. Iran may also learn to falsify data, such as AIS tracker information. For every new measure or new tool that identifies missile activity, Iran may develop a countermeasure. As NGOs increasingly leverage sophisticated imagery and deep data techniques, there is a risk that a missile-related disclosure made by an NGO may be of greater value to Iran than to the public. These panelists also warned that open source analysis by NGOs may introduce inaccurate information that can be disseminated rapidly in a political environment in which suspicion, disinformation, and unfounded accusations flourish. According to these panelists, open source analysis by NGOs should be provided to governments so that it can be assessed, validated, and perhaps merged with other sources of information held exclusively by government. Governments have a far greater capacity – largely through intelligence sources and methods, but often through negotiated inspection, information-sharing, and confidence building measures – to discover and penetrate weapons programs of concern. Thus, the increased NGO contribution, these panelists concluded, does not diminish the primacy of governments in monitoring and, more importantly, in making verification determinations. These latter are policy judgments that can only be performed by the state parties to international agreements. Other panelists noted that open source information and data analytic techniques are now part of the monitoring landscape. NGOs use these tools, as do an increasing number of governments, including U.S. adversaries like Iran. The curve of adaptation and counter adaptation has exponentially increased alongside the increase in open source information. Finally, the panel noted that NGOs often are driven by an imperative to publish findings quickly and to demonstrate a measurable public impact. Such imperatives may expose NGOs to error traps, which can have reputational and funding repercussions. These imperatives must be balanced against a certain responsibility to consult government before publicizing a particular revelation. Iran’s ballistic missiles have been integrated into its conventional warfighting capability; an agreement restricting Iran’s missile program therefore could instead seek to limit the parts of the program that are of greatest concern for nuclear weapon delivery. Annual U.S. intelligence threat assessments regularly conclude that “Iran’s ballistic missiles are inherently capable of delivering WMD” and that Iran “would choose ballistic missiles as its preferred method of delivering nuclear weapons, if it builds them.” However, the panel found that Iran’s ballistic missile program should not be seen as exclusively dedicated to that purpose. Iran has integrated hundreds of short- and medium-range ballistic missiles into its conventional forces as the bedrock of its regional warfighting and deterrence capabilities. Historically, the utility of these missiles has been limited by their poor accuracy; when conventionally armed, they function as a terror weapon to threaten cities, useful for coercion and deterrence in the absence of a modern air force. Since 2010, however, Iran appears to have prioritized improving the accuracy and lethality of its missiles. Iran’s missile doctrine has evolved in tandem, from one of coercion and deterrence to warfighting. Iran wants to make its missiles more useable in conventional warfare. Several recent events support this assessment. Iran has transferred short-range ballistic missiles to proxies in Yemen and Lebanon. Such transfers include more sophisticated systems, like the Qiam-1 missile, which is a modified version of the Scud C, several of which have been fired at civilian targets in Saudi Arabia by the Houthis in Yemen. This use provides valuable test data for Iranian engineers to improve the missile’s performance. Iran is also using these missiles directly in military operations. It fired about six short-range ballistic missiles from within its territory against Islamic State (ISIS) positions in Syria, in June 2017 and again in October 2018, in retaliation for ISIS attacks inside Iran. In both cases, Iran is reported to have fired both the Qiam-1 and the Zolfaghar, a single-stage, solid-fuel ballistic missile. Because of the evolution of its missile doctrine, several panelists predicted that Iran would not completely give up its missile arsenal. The panel agreed that it would be easier to restrict systems that have not yet been successfully tested or deployed. Thus, it might be difficult to negotiate an agreement limiting flight tests of all missiles that can send a 500 kilogram payload 300 kilometers, which is the Missile Technology Control Regime (MTCR) threshold definition for nuclear-capable missiles; Iran has a number of operational missiles that meet this threshold. It might be possible to negotiate an agreement limiting ballistic missile types beyond medium range. For example, high-ranking Iranian military commanders have said that the Supreme Leader has restricted the range of ballistic missiles manufactured in the country to 2,000 kilometers. One panelist noted that such a restriction would become less meaningful if Iran were to develop sea-launched or air-launched missiles. Several panelists emphasized that range restrictions must be combined with payload restrictions to meaningfully restrict Iran’s missile capability. It would also be important to impose limits on Iran’s program to launch satellites using domestic space launch vehicles (SLVs). Many components and technologies used to make SLVs are interchangeable with those used to make long-range ballistic missiles. SLV launches provide valuable data on stage separation, which is useful for intercontinental ballistic missile (ICBM) development. Ideally, Iran should be convinced to forgo SLVs in exchange for launching its satellites on other countries’ boosters. If an agreement includes a “carve out” for space launch, some panelists suggested several specific restrictions, including a limit on rocket diameter, a prohibition on the use of solid-fuel propellant, and a prohibition on the development of countermeasures such as defensive decoy or spoofing technologies. There was disagreement among the panelists about the value of a compromise that allows Iran to continue developing SLVs. Some panelists assessed that arms control limitations on Iran’s missile program have few near-term prospects, especially following the withdrawal of the United States from the JCPOA. Other panelists argued that Iran may soon be willing to negotiate with the United States on a broad range of issues of concern, including missiles, as a consequence of the full re-imposition of U.S. sanctions and the dire consequences of this action on the Iranian economy. The parameters of an agreement restricting Iran’s missiles should be guided by the negotiated monitoring measures; on-site inspection and data declarations would be critical for monitoring certain restrictions but would be difficult to negotiate; the use of open source tools do not need to be negotiated and can support monitoring and help detect cheating. The open source tools and data described above can support monitoring in several ways: they reduce the need for on-site access and therefore make monitoring terms with satisfactory provisions more negotiable; they increase the opportunity to detect cheating, further restricting Iran’s opportunities to do so openly; and they provide a source of information on cheating more useable in diplomacy with Iran, with other countries, and with the public. One panelist noted that open source tools are valuable because their use would not need to be negotiated with Iran. Information exchanges and on-site inspections, while more valuable, would be more difficult to negotiate. The panel agreed that the monitoring requirements for an agreement should be driven by what is being controlled. Any solution should ensure the ability to be able to monitor well what the agreement restricts. Flight tests are impossible to hide completely. A ban on all flight tests of missiles defined as nuclear-capable by the MTCR could be monitored by the United States unilaterally from outside of Iran, using remote sensing technologies. Other governments and non-governmental actors could also monitor and assess aspects of some flight tests using commercially available imagery and other data. A ban on flight tests of longer-range missiles might similarly be monitored. Ensuring that Iran is abiding by range restrictions would be enhanced with on-site inspection, although the terms of such access, particularly to sites run by the military, would be difficult to negotiate. The example of Iraq illustrates the value of robust on-site inspections. Limits on the range of Iraqi missiles in the 1990s were enforced with great vigor by the U.N. Special Commission (UNSCOM). UNSCOM set specific limits on missile diameter and had rules to ensure that it could observe engine testing. UNSCOM also set limits on cruise missile flight-testing that required very intrusive monitoring including putting in place independent missile flight test tracking equipment. Ultimately, the only clear violation of UNSCOM limits was Iraq’s al Samoud missile, which exceeded range limits by about ten percent. As described above, engine tests are often conducted outdoors and have a substantial signature. Such tests could therefore be observed using remote sensing technologies, assuming the tests are being undertaken at known sites. However, tests could be conducted indoors or at undeclared sites, which would make remote detection much more difficult. Monitoring the parameters of Iran’s space launch program would involve a similar trade off. Remote images of satellite launch sites would provide useful information but perhaps not enough to distinguish work on SLVs from work on ICBMs. Physical access to space launch sites deemed civilian may be easier to negotiate than missile production and test sites run by the military. Monitoring missile inventories to ensure compliance with caps on the number of systems would be difficult to monitor without some form of on-site inspection and data declarations by Iran. The results of data engineering might identify procurement that suggests Iran is violating the terms of an agreement, for instance by seeking to acquire or develop higher-energy propellants or advanced guidance components or materials. This would be possible only to the extent that the items or parties involved can be linked to Iran’s missile program. Pairing remote sensing technologies with maritime AIS or airplane ADS transmissions could help identify possible instances of illicit missile-related transfers to Iran. Data engineering might also make it easier to identify and isolate unusual or significant trade or transit activity that suggests a violation, and provide inputs for governments to correlate with classified data. Several panelists noted that successfully monitoring an agreement with Iran would involve the use of both public and national technical means in order to create a synergy among different methods of discovery of relevant Iranian activities. Evidence of violation generated through public technical means, and validated by governments, could be presented to Iran without disclosing classified sources and methods. However, it may take time to marshal such public information. For instance, the United States forestalled confronting Russia with evidence of its violation of the INF Treaty for fear of revealing sources and methods that could not easily be replaced. It took several years before lower-grade public sources could be used to make the public verification judgment that Russia had violated the Treaty. If Iran agreed to negotiated limits on its missile program, elements of an agreement could be informed by other agreements on delivery vehicles, such as the INF Treaty. There are useful precedents and best practices that could inform a verification regime for Iran’s missiles. The INF Treaty, in particular, provides useful guidance. It eliminated an entire class of ground-based ballistic and cruise missiles with ranges between 500 and 5,000 kilometers held by the Soviet Union and the United States. The INF Treaty elaborated multiple specific monitoring measures, including detailed data exchanges, five types of on-site inspection (including baseline, close-out, elimination, short-notice, and portal monitoring), the principal of non-interference with national technical means along with cooperative measures intended to enhance the use of such means for monitoring, and a consultative mechanism. In applying precedents and approaches from the INF Treaty to Iran, the panel described the following requirements: a missile data declaration from Iran to provide a baseline for what is being controlled and the areas where controlled systems or technologies are located; routine inspections and cooperative, persistent monitoring measures of locations where cheating would be easiest; a method of challenge inspection to gather and verify data on compliance concerns; and the use of national technical means augmented by robust exploitation of open data and techniques. For example, optical and SAR imagery might be used to monitor the “back door” of a suspect site subject to an on-site inspection, to observe whether Iran is seeking to hide or remove items. All of these requirements should be driven by the objective of detecting militarily significant non-compliance. Like the INF Treaty, an agreement with Iran should establish a consultative mechanism that can be used to resolve anomalies or disputes. This consultative mechanism would create a forum in which monitoring experts and Iranian officials could exchange information and findings related to verification of the agreement. Such a mechanism also has the benefit of building greater transparency with Iranian officials and enhancing channels of communication between Iran, the United States, and other parties to the agreement. Any agreement with Iran must also cover missile technology transfers, in particular missile technology transfer between Iran and North Korea. The INF Treaty may offer useful guidance since it included restrictions on technology transfers to allies as a means of circumventing the Treaty. In addition, several panelists emphasized that like the INF, an agreement with Iran must cover both cruise and ballistic missiles. An exclusive focus on ballistic missiles, as is the case in some of the restrictions of current and past U.N. Security Council resolutions, would allow Iran to advance its cruise missile program. Finally, the panel noted a key area where an agreement with Iran would differ from the INF Treaty. The INF Treaty was a reciprocal arrangement where both sides agreed to implement the same restrictions. Like the JCPOA, in an agreement on missiles, Iran would be accepting restrictions on its program in exchange for economic gain through sanctions easing. This formula would not be straightforward and would need to be calibrated through negotiation. “Transcript: Iran’s Missile Proliferation: A Conversation with Special Envoy Brian Hook,” Hudston Institute, September 19, 2018, available at https://www.hudson.org/research/14590-transcript-iran-s-missile-proliferation-a-conversation-with-special-envoy-brian-hook. Christopher Stubbs and Sidney Drell, “Public Domain Treaty Compliance Verification in the Digital Age,” IEEE Technology and Society Magazine, Winter 2013. Iran reportedly conducted another test of the Khorramshahr missile in December 2018. Max Fisher, “Deep in the Desert, Iran Quietly Advances Missile Technology,” New York Times, May 23, 2018, available at https://www.nytimes.com/2018/05/23/world/middleeast/iran-missiles.html. The Harmonized System (HS) is an international nomenclature for the classification of products. It allows participating countries to classify traded goods on a common six-digit code basis for customs purposes. Statement for the Record, Worldwide Threat Assessment of the U.S. Intelligence Community, Senate Select Committee on Intelligence, May 11, 2017, available at https://www.dni.gov/files/documents/Newsroom/Testimonies/SSCI%20Unclassified%20SFR%20-%20Final.pdf. “Iran Commanders Say Supreme Leader Limiting Ballistic Missile Range,” Radio Free Europe Radio Liberty, October 31, 2017, available at https://www.rferl.org/a/iran-ballistic-missiles-range-200-km-khamenei/28826950.html.